Would you like to keep more of your hard earned money in your pocket? Our knowledge of how builders negotiate and our experience with builder incentives and mortgage programs are just a couple of the reasons why partnering with us in your new home purchase can accomplish just that. The best part is that you benefit from our knowledge and experience, but never have to pay us a dime. Some buyers decide to purchase new construction homes built from the ground up, which may be the way you’d like to go when it comes to making the biggest purchase of your life. 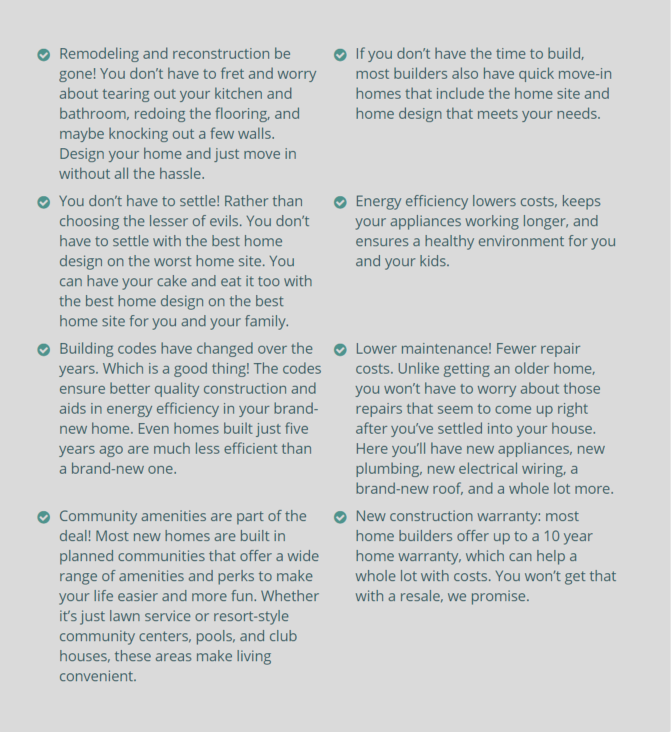 We have a fantastic checklist for you all that discusses the benefits of new construction home buying. You can design your dream home your way every step of the way.